Svetovid was protector of the arable lands and the God of the sun and light for those who believed in him. And for all others he was a god of war, destruction and defeat. Svetovid is also known under other names, depending on the particular Slavic tribe: Svyentovit, Svantovit, Swietowit, Svevid or simply Vid. 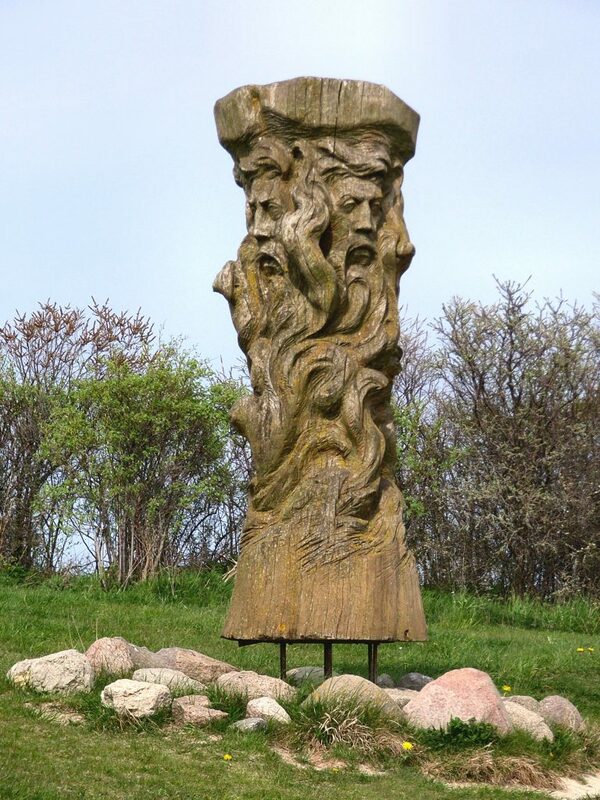 Svetovid was main deity of Baltic Slavs and his cult is highly connected with fortress Arkona, located at Ruyan (Rugen) Island, which was once considered Holy land of the Slavs. The bulk of data about Svetovid comes from this ancient Slavic sanctuary. In the center of Arkona was temple of god Svetovid surrounded by two wooden fences. The temple was also made of wood, like all other Slavic temples, so today we have almost no remnants of these buildings. It was highly decorated with carvings and paintings. The size of temple was 20x20m and in inner part of building was statue of god, 8m height, also made of wood. Svetovid had four necks and four heads, which represented small pantheon of main Slavic deities: Perun, Svarog, Lada and Mokos. In his right hand he held horn made of different kinds of metals. This horn was filled with wine or nectar and according to the quantity of liquid in it, the priest predicted future of the land. In the left arm he held a bow. In possession of Svetovid was also a massive sword made of silver. The body of statue was with carvings divided in three parts. The upper part symbolized the spiritual world, middle was material and the lower part symbolized hell. The sanctuary of Svetovid in Arkona was destroyed in the year 1168 by Danish king Valdemar. The statue of god was torn down, cut in pieces and burned. Once per year, during the harvest period, in front of a temple, people sacrificed parts of animals, mostly heads of domestic animals. This was also a great religious feast in which many people took a part. The priest would then predict abundance or scarcity in the upcoming year and pray to Svetovid for fortune and prosperity for the whole land. The day before the feast, the priest would clean the temple with the broom taking care not to breath inside the temple. When he needed air he would simply run to the door to take a breath since he could not allow the human breath to desecrate the sacred. On the day of the celebration, priest would take the horn from the statue. If the quantity of liquid decreased, the following year would be poor, and if it is the same it promised abundance. The rest of the day people would eat, drink and dance which also was the part of the ritual and celebration of Svetovid. Svetovid’s temple was also a well-known oracle, where Slavs came to learn their future. In the temple, a white horse was kept, which belonged to Svetovid. No one may touch it except the priest who would take care of the temple. It was believed that God rode on white horse and lead his people in combats against enemies. The white horse was used in prediction of outcome of the approaching battles. Before going to war, in front of the temple priests would set the triple row of spears and horse was taken to cross over them. In case the horse started with the right leg then it was considered that outcome would be favourable. And if he started with left then war would be postponed. The temple possessed a great treasure. Slavs were obligated to give the part of their harvest to the temple as well as prey they seized by robbery. There are a lot of theories about the exact meaning of Svetovid’s name. Some scholars think that name is combination of words “svet” which means saint and word “vit” which means hero, knight. This way Svetovid’s name would mean St. Hero or St. Knight. Others think that word “vid” means light, so the name can be translated as Saint or Holy light. But the closest is the theory where word “vid” is translated as world, and “sve” as all, everything, entire. According to this, Svetovid is God who sees everything and knows everything. As a confirmation of this is a fact that Svetovid is presented as God with four heads turned on the four directions of the world. So he was the one who observed the universe, saw and heard everything.